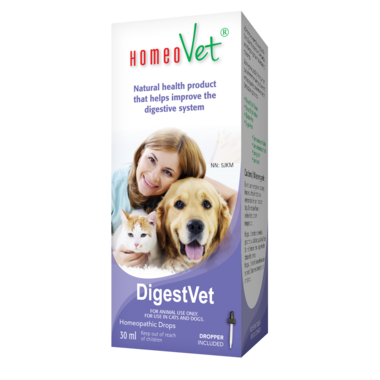 HomeoVet DigestVet Pet Supplements are natural supplements that help to improve your pets digestive health. These supplements can be used for both cats and dogs and have no artificial flavour or colour. Dosage: 3 times a day in a bit of water. For pets under 20 lbs, only 5 drops per day. Do not use in pregnant or lactating females unless directed by a veterinarian. Ingredients: Antimonium crudum 5c,Arsenicum album 5c,chelidonium majus 5c,digitalis purpurea 5c,hydrastis canadensis 5c,lycopodium clavatum 5c,mercurius solubilis 5c,nux vomica 5c,phosphorus 5c,podophyllum 5c.